We are proud to bring many collective years of experience to the local area and provide quality service. Reasonable rates and a desire to be first on your list when planning a trip or just taking care of your investment. Our mission is to bring a different kind of service to the industry. 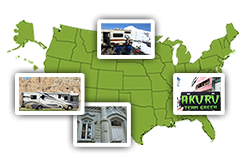 We work together towards one goal and that is to be the only one you think of when it comes to servicing your RV. "Large or small we do it all". Open Saturdays 9am to 1pm and road-calls too! Easy access to freeways and close to campgrounds. Try us you will like us! Call today and "Experience service for the first time"